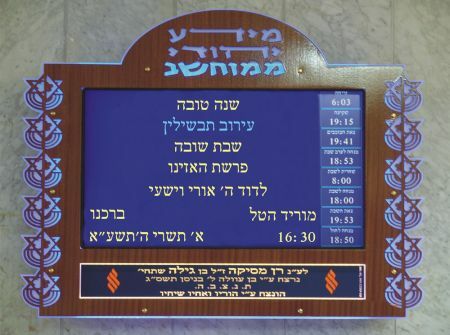 Information prayer times are either present inside or outside a synagogue. With regards to large synagogues, information prayer times are available in both locations. These 2 will often be displayed on a plaque. For example, the different times for a minyan. A lot of synagogues have many minyans all day long. This means that the information prayer times have to be very well displayed. There are a number of cases where the information prayer times in synagogues aren't well displayed, resulting in many upset attendees. We at Or-El have turned all of this on its head by providing customers with the best plaques/display boards for information prayer times. All prayer plaques provided by Or-El have the safest LED lighting out there! We provide this great feature with our other top products too. The LED lighting which we provide with all prayer plaques consumes less power, while providing higher-intensity and better distributed lighting and heat. Not to mention higher life expectancy. The technology we use also aligns with standards that have come into effect within EU countries. Our information prayer times are available both online and at our shop in Tel Aviv. As a result, you should check out our collection that is waiting for you! Due to the wide use of the Internet, our website (www.or-el.co.il/len/) has attracted many visitors and customers from Israel and other destinations. We at Or-El are happy that more and more people are benefiting from the information prayer times that can now be purchased from us with a click of a button. You should visit our website as often as possible, so you can see all the new merchandise that we are constantly releasing. At least now you can rely on us for information prayer times and all of the other important products that are vital for synagogues and different private/public ceremonies.